Every weekend we dig into the archives. This post by Nick was originally published in March 2015. A while ago Kent and I made a proposal for a tree lined boulevard in Auckland. Curiously, the biggest theme of the comments section was about the perceived lack of value that trees bring to the street corridor. It seems that most people consider street trees to be at best, decoration, and at worst a waste of time and money, dangerous even. Indeed I have seen road design handbooks whose only mention of trees was to outline all their problems in the section of ‘non-frangible fixed hazards’ (in traffic engineering terms, frangible means something that will break off when you drive into it, rather than stay solid and crumple your car around it). I wanted to use this post to outline some of the reasons why trees are beneficial for our city streets. Not just beneficial from appearance or character, but beneficial in the sense of making the street work better in terms of its transportation and land use. A word of clarification up front however. I am talking about trees on city streets, particularly urban inner city streets with speed limits of 50km/h or less and ‘stuff’ around that people actually do there (like live, work or play, and not just move). Trees on rural highways and back roads with nothing going on but through traffic are a different story. An outer row of trees can provide physical separation between the traffic lanes and the footpath, cycleway and retail frontages. Your friendly local highway designer will tell you that trees are a fixed hazard, according to the Austroads design manual at least, and that a high speed highway needs a wide exclusion zone either side so that speeding drivers who run off the road can careen onwards without hitting anything. While this is a very appropriate safety treatment for a state highway out the back of Waipukarau, it is completely inappropriate for a city centre arterial. For a start we don’t want a high speed highways through our inner city. That what the motorways are for and we don’t want cars and trucks to speed through dense people-focussed places at street level. Rather we want move plenty of vehicles in an efficient manner while keeping to a reasonable speed limit for a city arterial. Consistent reliable travel times and total throughput are far more important that high speed alone. Secondly, we certainly don’t want vehicles running off the traffic lanes at high speed. In an urban context this means running over whoever happens to be walking on the footpath at the time and smashing into the front window of a shop or office building! We want to keep traffic in the traffic lanes. Thirdly, we don’t want to waste scarce city land on wide empty shoulders for our main roads: we can’t afford the land and don’t want the severance it creates. Nobody wants downtown to look like Albany (and in fact I’m not sure if anyone especially wants Albany to look like Albany either! ), and we shouldn’t really be spending good money to create empty verges in town centres. So indeed, one very practical reason for street trees is to keep traffic in the traffic lanes and out of the footpath and shops. We could use bollards or Jersey barriers for separation, or wide swathes of land, or we could use trees. 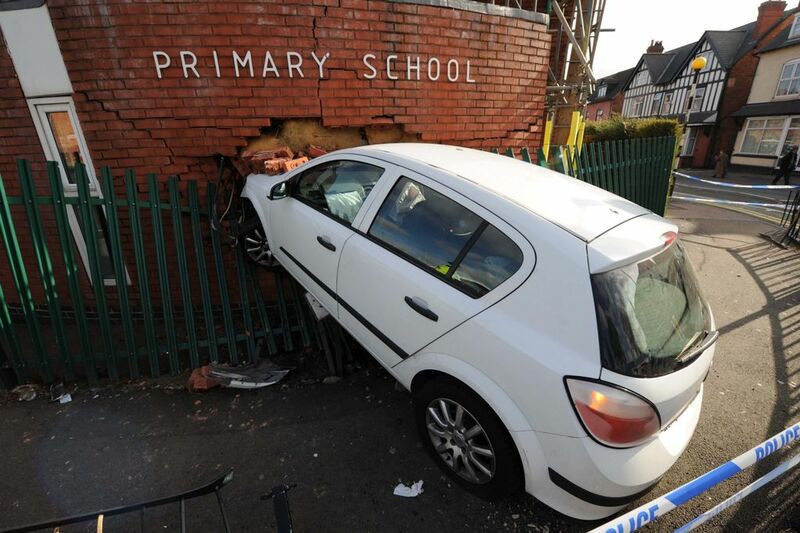 Better to hit a tree than a primary school? Trees provide a physical barrier to prevent vehicles being parked across the kerb. This physically stops people from parking vehicles on the footpath, or in medians or other non-traffic spaces. Again we could install bollards all the way along the edge of the road, but trees can do the same job too. A physical barrier to stop people parking on the footpath. Street trees provide shade to the footpath and cycleway. Shade would not be of concern to someone designing a rural highway, where they don’t want nor expect any pedestrians or anyone else not in a vehicle for that matter. But if we are talking inner city streets such things must be considered. People walk, cycle, wait, linger and loiter on city streets and a little shade goes a long way in the summertime. Indeed in Melbourne they have started a program of street tree planting to mitigate the increasing number of heatwaves, and shading the tarmac is a good way to reduce the urban heat island effect and manage stormwater. Trees are a handy component of a complete street that has many simultaneous uses, and users. Well placed trees can shade the footpath to provide a comfortable walking environment. 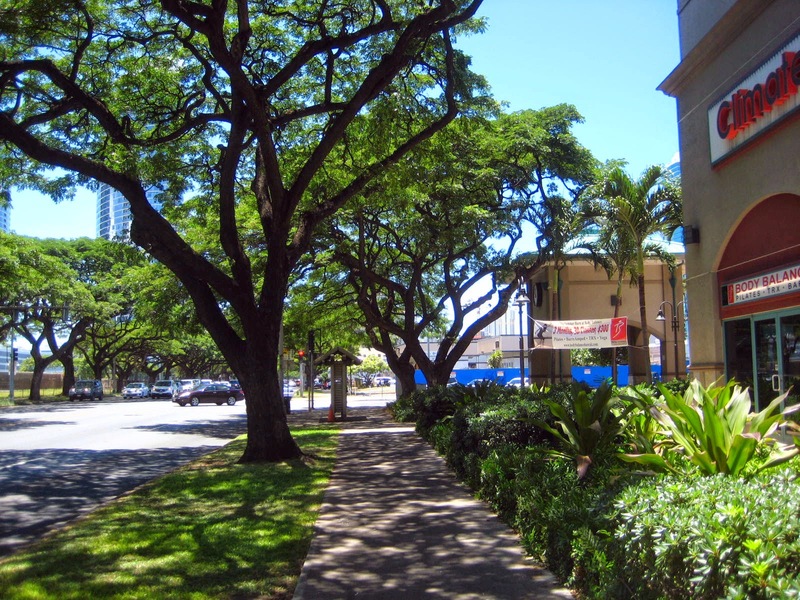 Trees can visually screen heavy traffic from the footpath and adjacent buildings. …and to a lesser degree provide some containment of noise and fumes. Once again this is a very practical concern if we are discussing inner city corridors, particularly those that are ripe for commercial development. Heavy traffic is a necessary evil on city arterials, generally speaking, but it’s impact can be mitigated through design elements such as this. Trees provide a perceptual barrier that visually narrows the the carriageway. Perhaps most importantly, a rows of trees can be used to visually narrow a simple two way street or split the opposing directions of a multi-lane arterial with a physical and perceptual barrier. 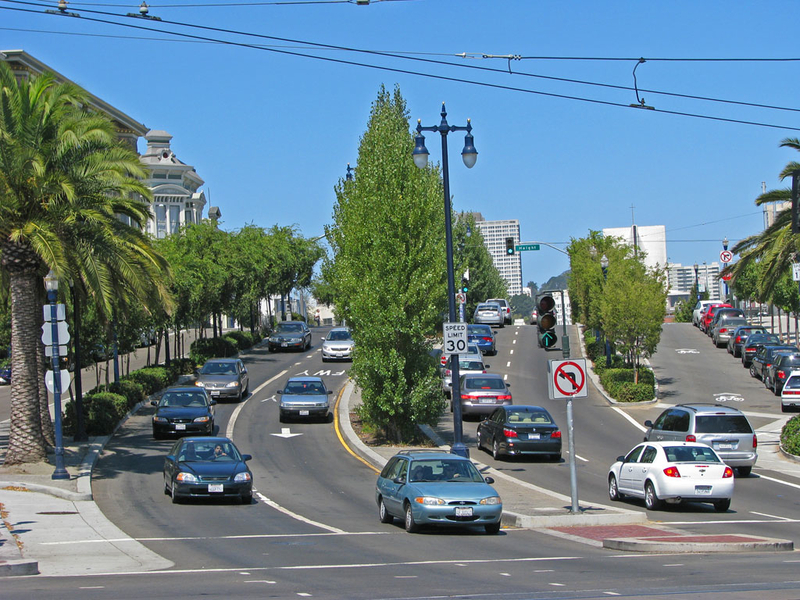 In the case of a multiway boulevard a row of trees can be used separate the local and through lanes from each other. Overseas, using trees to separate lanes is an intentional feature designed to break up the wide roadway into discrete sections, each section being relatively narrow. The purpose of this is to perceptually narrow and contain each piece of road to no more than two narrow lanes to remove the visual cues that encourage speeding. In effect the trees act like side walls, narrowing each part of the road and forcing drivers to maintain limited speeds. Without them, any multi-lane street would present you with a wide, straight, flat roadway many lanes wide, all if which tell your subconscious mind that you are able to put your foot down. Of course the highway handbooks define this as the problem of ‘shy lines’, assuming lanes should be as fast and wide as possible and describing anything less in terms of reduced capacity. But this capacity reduction comes from lower speeds, which is precisely the thing we are after on streets, if not highways. 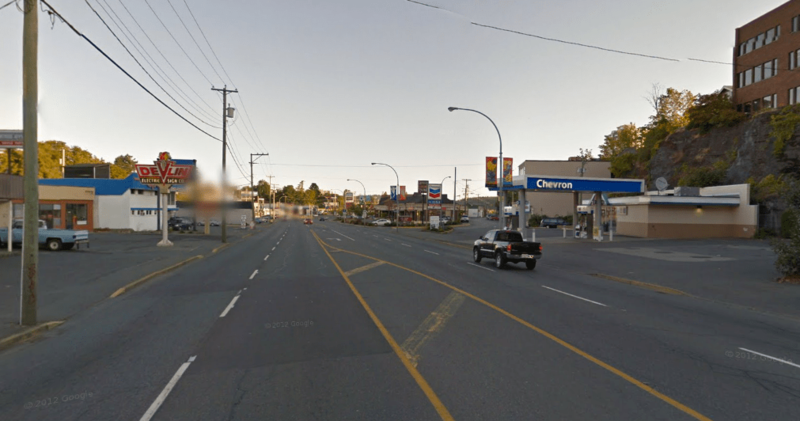 Furthermore the shy line effect is almost negligible on 50km/h arterials, it’s really a highway thing. So we prefer to see this ‘problem’ as part of the solution. Here the trees become a perceptual traffic safety device for reducing speeding and keeping traffic moving efficiently at the proper speed limit. Octavia Boulevard, SF. Rows of trees turn an eight lane monster into groups of two lane streets. But what about simple beautification? Finally however, what if the trees were just ‘useless’ beautification? And what of the potential for ‘useless’ good quality paving, street furniture, artworks even? Is it a waste of time to make things attractive? Should we spend money on a nice looking and pleasant urban environment? In the case of the city centre or other town centres, absolutely we should. Recall what we are talking about here are on the whole prime commercial redevelopment sites, where we should aim to maximise both the sale value of the land release, and the intensity and value of the subsequent developments. Simple ‘beautification’ would reap big dividends on the final form of development in the corridor. That’s not to say street trees are all you need to create a blue chip commercial precinct bringing in rates and business investment, but they definitely contribute. Beautification is a practical function when it comes to catalysing redevelopment. So there we are, several reasons why street trees should be considered as technical components of street design with specific transport outcomes. For a wider discussion of all the benefits of street trees, transport and otherwise, check out the 22 Benefits of Urban Street Trees by Dan Burden. It would be great to see most of the trees being natives. It would be helpful in arresting the decline of native bird numbers. Perhaps we could let the birds decide. If we did we would plant wattles, Taiwan cherry trees, camellias, guavas, bottlebrush and waratahs . It is a mistake to think all native birds need native trees. Wattles were planted on Tiritiri Matangi Island to provide a better food source until the native plantings matured. Native birds like exotic trees the same way I like eating curry, even though my ancestors knew nothing about spices. And loquats, persimmons, gum… Tui nest in my pear tree sometimes. But the birds you see enjoying these trees are usually species that aren’t on the brink of extinction. For those rarer birds, skinks, insects, spiders we need the natives above anything else. And also an understorey… which isn’t always possible for street trees. I reckon we use a mixture for street trees, but start to pay some better attention to Auckland’s vanishing biodiversity in corridors of thick well-chosen native plantings. Natives are best in large groups or better still if we could have continuous corridors so the fauna can spread. But as street trees natives are a bit dull. Good street trees give shade in summer, light in winter, colour in autumn and flowers in spring. Natives don’t do that. As for skinks, the kingfisher in my back yard just loves them. I’m of a horses for courses view: use the specie with the right qualities for what you want to achieve in each street. Streets are an unashamedly artificial and constructed environment, I don’t see a need to necessarily use native trees for that context of something else with grow better and driver more. I find that too many native trees can be rather dull. I’d prefer more variety and colours. Native trees do have there place as they of course are the most suited to most environments but shouldn’t be the be all of everything. I’m not suggesting cluttering up the footpaths, just that the necessity level of furniture can be implemented in a way that deters parking. These psychological and physiological effects of street trees are now well-researched. Also (and this is touched on but not overtly stated), street trees improve social outcomes, through increased feelings of security, association and belonging, etc. Great post that is and was. Yes, trees, love them, I’ve come to notice & appreciate the good affect trees in urban areas have. Trees also help in reduce heat Island effect in urban areas and reduce pollution especially removing dust particulates stick to the leaves and are washed away by rain. I like Heidi’s comment. The often over-looked mental health benefits of trees and green places. I have heard too that the plants and trees ‘deal with’ CO2 and improve oxygen in the air we breath. Went through a whole place making process with AT to beautify Mackelvie Street as part of the project installing raised tables. Was meant to get trees and street furniture. One particularly vociferous retailer seems to have won. No Trees or furniture and in the last month AT freshened up a huge painted flush medium. Without many great examples of placemaking it seems a lot of people still favour a motorway vibe to their local streets. But, AT have a Sustainability Framework to follow. I have asked who was representing the Sustainability Framework at the RASF discussion on one project – the stunned silence implied no-one was. I reckon it’s a good question to ask of the Mackelvie St project. And who was representing the various Council plans that talk about street trees – eg the Parks and Open Spaces Policy, the Auckland Plan. If these are not being represented in the RASF discussion, why not? If someone from the local board was representing the Council plans (they shouldn’t have been, I think. They would have enough local placemaking documents to be representing), did they insist on trees? Did they feel they wouldn’t get anywhere? Why not? The RASF may be under review, but the review is not finished, as I understand it. So it stands as it is. Meaning that AT should not have felt able to bow to the pressure of one retailer in the face of multiple documents stating the need for trees. Regardless of the rest, how that side street even gets a painted flush median boggles the mind. Its a side lane of a shopping strip dressed up like Great South Road. The biggest benefits are for people’s wellbeing and quality of life, and bigger is better! But they can also help with stormwater. Biophilia is a key element of mental health and the Healthy Streets tests include trees! The costs of cleaning up after deciduous trees is something reflected in the US research – I love my neighbour / the council to have trees on their land where I can benefit, but when I’m responsible my value is a bit lower. Great photos and I’m all in favour of beautifying the city. But only if it comes with an agreement that those trees could be removed at a later date if required. Look at the folly of the Garnet Rd cycleway in Auckland. A wide street with extremely wide grass berms but nothing sane could be done because trees had been planted and god forbid we cut down some 6-8foot high trees and plant new ones when we’re done. Everyone loves trees but they’re not sentient beings and can be replaced. I’m willing to accept exceptions for well established ‘character’ trees, but let’s be practical. Saving the trees there was just one of several excuses not to have a cycleway.